Learn how to disable the ink levels in the following printer models, if you have any additional questions please do it gladly help you. 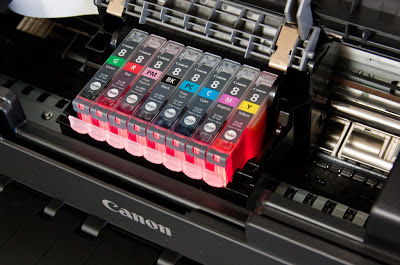 Canon ink printers, all have a system that tells the computer the average amount of ink cartridges have, it works through the printer software, which when we put a new cartridge recognized. Of that moment on, we counted the pages to be printed as suppose the ink cartridge has been spent (by the number of pages that have printed), we will get an error that this is empty. The truth is it was a very creative act of Canon, only this becomes a problem when the printer is out of ink and supposedly locked to print. What follows is a series of recommendations to overcome these messages, it is important to know that this will not restore the ink levels, ie it will not return to the levels when we bought the cartridge. Only the message will disappear and prevents us from printing to the printer will tell you "no problem, we want to continue printing even if the cartridges are low on ink." It's simple, just press the button stop / reset the printer for a certain time, this time will depend on what the printer you use. This procedure works for four series of printers, then the detailed list of their respective models. If you have any questions or recommendations, just write a comment will gladly help you.